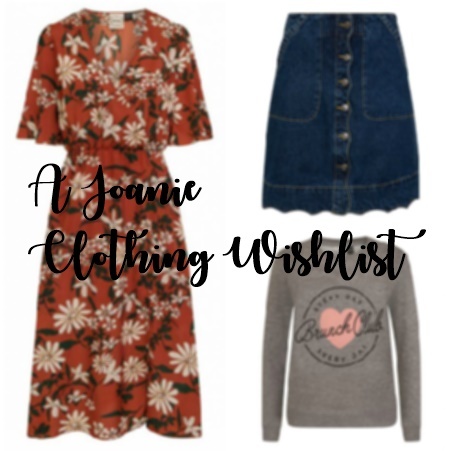 I'm a huge fan of Joanie Clothing and there's quite a few pieces which I have my eyes on right now so I thought I'd do something a little different and do a Joanie Wishlist. I feel like everyone is always talking about the usual places like New Look, ASOS, Topshop etc and I feel like people are missing out on a right gem with Joanie. I do already own a few pieces from Joanie and they are always good quality and really comfortable to wear so if you're on the look out for some cute new pieces for your A/W wardrobe and like something a little different and/or vintage inspired then hopefully this post will give you some inspiration! Which pieces from my wishlist are your faves? My top 3 are the Brunch Club Sweatshirt, Deidra Green Flippy Skirt and the Barb Green Floral Tea Dress! These are great picks! I've never heard of Joanie Clothing but will definitely be checking out their website after writing this. My favourites you've posted are the T-Rex t-shirt, the scalloped hem denim skirt and the floral midi skirt.